It was two weeks after the fact but it finally happened. We were able to celebrate my husband's birthday this past weekend. Due to his busy work schedule, the birthday festivities were extremely delayed. The kids had been plotting and planning to take him out to his (their) favorite Japanese restaurant. And, ever though he ended up working later than planned on Friday, we still managed to make it to Savannah for a late dinner. We all ate our fill of soup, salad, veggies, fried rice, and Hibachi shrimp and steak. My younger son, who was up way past his bedtime, ate until he was beyond full then tucked his exhausted head under my arm. He fell asleep in the car as soon as we left the restaurant. What a peaceful drive home! One of Eric's favorite desserts is cheesecake. I pulled out an old recipe that he's always enjoyed. It's so simple and delicious. He enjoyed a slice before he left for another marathon work schedule. But, I'm glad he made it home to celebrate for a little while. Spread the cookie dough in the bottom of a 9"x13" baking dish. Combine the remaining ingredients until smooth and pour over the cookie dough. Bake at 350 degrees for 30 minutes. Keep refrigerated. Funny, or not so funny, how our busy lives get in the way of celebrating our special days. 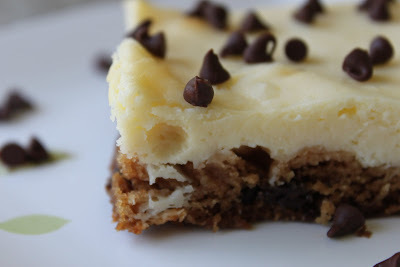 We love these Choc Chip Cheesecake bars. I make them several times a year. My son and his friends request them quite often! YUM! Happy Birthday to him. Cheesecake + Cookies = awesome! I'm not usually into refrigerator dough...but doctored up like this looks pretty excellent. I might try it this weekend while my in laws are visiting. Everything you ,ale always looks so good! 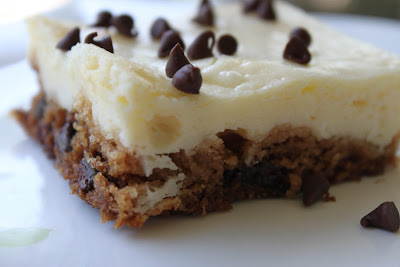 I love that you use cookie dough from a tube! :) I think it makes excellent crust. Can't wait to try this out! This looks delicious, as always :) Stumbling this!! This looks delicious - and easy to boot! I've never made these but I've had them before and they are sooo good. I love the creamy cheesecake over top of a buttery cookie. YUM! Just wanted to stop by and let you know that you will be featured on this week's Sweet Tooth Favorites. Stop by on Saturday and grab a button. I've also Stumbled your recipe. This looks so good. I love the semi homemade recipe. 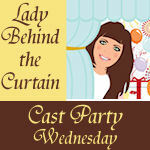 Thanks for sharing at Cast Party Wednesday. I hope to see you back next week.